Many of us have to stand for multiple hours each day, it’s not a new phenomenon. From nurses to factory workers and thousands of occupations in-between, workers have been on their feet 8+ hours per day for hundreds of years. Thankfully, gone are the days of old-fashioned shoes that rub everywhere they shouldn’t! We now have access to trainers, boots and far more scientifically designed footwear to look after our feet, the choice is bewildering! Are you struggling to find a good pair of shoes for work, or need a quality pair of sports shoes for a new hobby? We’ve created a massive guide that will show you exactly how to stand all day long, in complete comfort and without storing up nasty medical conditions for later in your life. The Original and Best, Crocs! How to Choose Good Shoes for Standing All Day? If you’re a security guard, shop assistant or hairdresser, standing all day long is a (Rather painful) fact of life. We’ve picked two pairs of daily work shoes that look great, and protect your feet at the same time. You’ll probably be familiar with the Crocs name already. Manufacturers of the world famous “jelly shoe”, Crocs also offer some supremely comfortable daily wear shoes. This pair follows in the same footpath as earlier Crocs, (Excuse the pun!) with an oiled feel top that does mold itself to your feet. The upper is 100% synthetic, with a flexible man-made sole that should be extremely comfortable to wear day in day out. The upper is also fleece lined, making this a great show if you work in a cold climate and are regularly outside. Underfoot, there’s a strong rubber sole with a tread that gave me quite a bit of grip for day to day wear. I wore this pair in January, through a cold snap where temperatures got down to 41 Fahrenheit. I didn’t slip once and the fleece living did keep me warm. The only downside to these shoes at the moment is the fact they’re only available in black. We're sure that Crocs are working on this as the Tummler is a brilliant, comfortable anti-slip shoe and could greatly benefit from a tan version. I loved this shoe and think it’s perfect for chefs and restaurant staff, cleaners, shop assistants and factory workers where good anti-slip protection is vital. Verdict: Comfortable, warm and non-slip, just be sure you’ll be okay wearing black. You might already know about Algeria slip-on shoes already. There’s well known for supremely comfortable shoes worn the world over by busy women who spend their lives on their feet. These shoes are made from a leather upper, with a flexible man-made sole. Although there is a heel, it’s very small at 1.5 inches and does try to maintain a balance between style and comfort. There are 29 different styles to choose from, ensuring you don’t have to wear the same look each day. My wife is a registered nurse and spends 10 – 12 hours per day walking or standing. She had wanted to try out a pair of Algeria shoes for some time, so this pair was the ideal candidate! You can read our guide of comfortable nursing shoes. Overall these shoes are extremely comfortable for long-standing. The upper has enough give to avoid rubbing and soreness while the sole is supportive too. It took 3 days to break the shoes in, mostly breaking in the arch support which was quite stiff on day 1. Needless to say, from day 3 onwards these shoes have been nothing but comfortable to wear. Even after the initial test for our review my wife has continued wearing the Algeria’s for work. Verdict: Comfortable, stylish with enough tread to keep you safe in cold or damp environments. Just be sure to break them in well before embarking on a long shift. Standing all day on concrete brings its own set of issues. Being such a solid material, concrete offers no cushioning effect at all which puts huge amounts of pressure on your feet, lower joints and even spine. It’s for this reason many workers who spend their lives walking on concrete, tend to have quite bad back pain. It’s not heavy lifting that’s caused this, but the way concrete doesn’t cushion the effect of walking at all. What’s the best thing to look for in a shoe for concrete floors? Well, a much higher degree of padding and support in the sole is vital. With the floor not offering any cushioning effect, your shoes will have to work double-time to keep your joints safe. It’s also work thinking about warmth. Concrete tends to be a cold material, so any shoe bought for standing on concrete should be lined for warmth. Saucony have been making quality walking, running and working shoes for years now and have quite a reputation. Most of their shoes are designed to maximize comfort and are orthotic friendly. The pair we reviewed, the Saucony Men’s LE, is a trainer aimed at walkers or workers who spend much of their time outside. The upper is 100% leather while the sole is fully rubber. As with any good concrete shoe, these trainers have a well-padded interior with a thick and supportive rubber sole. These trainers have obviously been designed to offer support for walking on tarmac, asphalt and concrete plus they have more than enough padding to keep your feet warm. One of our review team is a dedicated runner, so it made sense for him to give these shoes a “run out”. He tried them for a week, running on purely tarmac and concrete paths to test how these would work out. Overall, he found them comfortable and did support his joints during running. The thick rubber sole does exactly what you need it to, providing a little bit of give to help support the lower limbs from the shock of walking on hard surfaces. The only slight negative he had, was the fact there’s no mesh to improve airflow. This is in comparison to sports running shoes however and mesh isn’t a great material to use for working shoes. Verdict: An attractive pair of trainers that should fit the bill perfectly for outdoor workers who need a shock absorbing sole that will keep them safe on concrete or other hard floors. We thought we should keep with the Saucony brand for our women’s selection too. After all, Saucony do know how to make a quality walking trainer. This pair, are available in both white and black with all the same attention to detail as the men’s pair above. You can expect a full leather upper and quality rubber sole, designed to be anti-slip and have plenty of “give” for walking on tarmacadam or concrete flooring. The interior of the trainer is well padded and designed to be worn straight from the word go. You’ll find no stretching or breaking in needed here. To test, we gave this review pair to one of our editing staffs girlfriend. She works in a busy conference and exhibition centre, covering plenty of kilometres every day on concrete, grass, tarmac and marble. She already suffers from knee ligament damage after a short career in women’s soccer when she was young. So if this pair of Saucony trainers can impress here, they should work anywhere! The overall theme during the few weeks testing was the comfort. Karen typically buys New Balance trainers as the support is far better than anything she’s tried from Nike or Adidas. However, she was impressed with the Saucony walking shoes. The only negative we found, was the clunky styling. Most workers probably aren’t all that bothered but one of the reasons Karen likes New Balance is the choice of styles, some quite feminine. Still, the overall quality, fit and comfort have given her something to think about. Karen says she is going to take a look at the Saucony range when her current pair is due for replacement. Verdict: A quality and comfortable pair of walking trainers that will work perfectly on hard surfaces. The only negative is the styling, which may or may not bother you, still a great quality trainer though. You might be thinking, “what has tennis got to do with my daily job”? Good question, and on the face of it there’s probably nothing, unless you’re Roger Federer! Still, if you think about it, Tennis players are on their feet for hours and hours during a game. This means their footwear is under the same pressures as any set of walking or working shoes, taking double or triple the punishment in a shorter space of time of course! Good Tennis shoes are shock absorbent, ultra-non-slippy for use on clay or grass courts plus they’re designed to be comfortable out of the box with no breaking in required. They might not have the reputation of Nike or Adidas, yet Asics make a mean pair of Tennis shoes and you’ll see many a professional player sporting a pair. The Gel-Resolution line is designed to offer extremely high levels of grip and also keep your feet cool and dry under load. That’s why the upper is almost all synthetic with fine mesh parts to keep your toes and arch dry. The sole is a mix of durable rubber and gel bubble at the back. This is pair for the course with Tennis shoes because of the high levels of abuse playing match puts on your lower joints and feet. I tested this pair out myself a few weeks ago, taking them running, cycling and also wearing them in work as much as I could. So far I’ve worn this pair of Asics for 280 hours (Not straight mind you!) and have nothing but praise for them. I’ve long considered non-Nike air bubbles to be a gimmick at best, nobody seems to have the technology down quite like them. The Asics have made me re-think this. However, they are comfortable with an absolute tonne of cushion in the sole. Another thing that’s impressed me is the huge range of styles available. Quite frequently, us guys have to put up with a limited variety of colours but not here! Tennis shoes are stylish as well as comfortable, who would have thought it! Verdict: Loads of styles to choose from, extremely comfortable with plenty of support and give. This pair should make a trusty companion for heavy work, standing and everyday life. It’s not just men’s Tennis shoes that get the Asics treatment, women are well represented under the Asics brand too. Same refinements are here, synthetic and well-ventilated upper with a comfortable and flexible sole with gel heel. The only difference between this pair and the men’s is a slight variation in the arch support, designed specifically for the needs of women. A similarly bewildering array of styles is on offer, some slightly toned down with a slightly more feminine design. Even so, the more colourful and crazy styles are there if you want them! We might not have a Tennis player in the office, (Shame!) yet we do have the next best thing. My PA and amateur squash player Amanda is going to take these trainers for a spin. Mother of 2 children she should be able to give them a pretty tough “real world” test. Amanda plays Squash one or two times a week. She has a mild form of Plantar Fasciitis which results in pain getting up in the morning and frequently has to get up from her desk during the day, to get a little exercise and stop her feet “seizing up”. The main benefit from wearing the Asics is the fact that the heel is so forgiving she says. Frequently, the morning after a Squash session is complete agony for Amanda, yet this pair of Asics have certainly helped to minimize the stress and that early morning pain. Amanda reported that although her pain will never truly go away, her time with the Asics has certainly dampened it down. Amanda was a fully converted member of the Nike Air tribe up until her test of the Asics Revolution 6, what happened next is a definite first for us. She’s bought a pair, in light green and yellow, I think that for a review it says all. Verdict: Our tester bought a pair during the test! Amanda reported extreme comfort, good range of styles and the fact it dampened the symptoms of her Plantar Fasciitis as the main reason for purchasing. This is where things get tricky! It’s all very well having to stand all day when you can wear an uber comfortable pair of trainers, gel bubble at the rear of course; not such an easy thing when you have a dress code to adhere to. A flexible upper that can be broken in easily. Thankfully, men’s dress shoes are reasonably well represented with plenty of brands and companies manufacturing quality shoes fit for the boardroom. Sadly, the boardroom is often the only place they’re designed to work in, leaving restaurant staff and other workers who need to look dapper while walking 8+ hours a day high and dry! This is where the Timberland PRO range comes in. Designed to look good, while being flexible and comfortable enough to put a long shift in, the Five Star pair has a leather upper and synthetic sole. This means that while the upper has all the look of a quality pair of dress shoes, the sole has more than enough flexibility while walking and should mold quite nicely to your feet over time. On review, we found the sole to be extremely comfortable. It’s not the most forgiving sole but you can see Timberland have tried to go for a simple, barefoot (Or as close to it as possible) design to try and allow your feet enough room to relax. The arch section is well formed, quite good considering how poor dress shoes are at providing support for people with arch problems. The upper is less flexible, as you might imagine with an all leather construction, yet it’s light years ahead of the competition and we feel it should break-in quite nicely over time. One very positive aspect of these shoes is the fact the insole is removable. To be fair the insole provided is quite a quality item in itself, yet the fact you can swap it over for a gel sole or something from the Scholl insole range is a nice touch for the busy worker. Verdict: A great pair of shoes for guys who need something classy that will flex and provide ample support throughout the day. We love the well-designed arch support and the fact you can swap the in-sole for a gel version if required. If you’re a woman who’s looking for a good quality flat shoe with an orthotic sole, the Vionic loafer is hard to beat. It has a high-quality leather upper, perfect for dress and office wear while the sole rubber with that all important orthotic footbed installed. We found the Vionic loafer quite flexible, even the leather upper. The sole is slightly less forgiving than we might have liked, yet that orthotic sole and arch support looks like it should provide excellent support for lengthy walks. As is fairly typical with women’s shoes, the list of styles, colours and patterns is huge – all have a 100% leather upper which is great to hear. To give this pair a real test, we asked for Amanda’s help again. This time, she kept away from the squash court and wore the Vionic’s to work and when looking after her children. Overall, Amanda clocked up a pretty impressive 108 hours standing, walking and playing. Her verdict? She loved the sole, giving her arch some well-needed support and offering an alternative to trainers when minimizing the effects of her Plantar Fasciitis. She was reasonably impressed with the upper. Although far less flexible than the trainers she normally sports, there was just enough to make them a viable option for the office and dressing up. The only negative was the flat sole. Even though the arch support is better than most shoes, Amanda is so used to orthotic designed trainers she found it hard to transition to flat dress shoes as an everyday item. Verdict: A well designed and durable shoe that gives a great option for women who need a works shoe that doesn’t cause any pain during daily use. Just be careful if you’ve been a trainer convert for many years, making the switch back to dress shoes can be difficult. Ah, the original and best comfort shoe! Despite its many detractors, the humble croc has saved many a busy person from painful heels and lower limb issues. I know, we're a little naughty for this review as Crocs tend to be “unisex” and wearable by both men and women. Still, we felt this pair was worth adding to our review regardless. Like most Crocs, this pair is 100% synthetic with the upper and sole made from the same gel-like material. It’s this amazingly flexible and cushioning gel that gives the Croc range its comfort credentials. Unlike some other Crocs, this show is specially designed for walking and standing for long periods. It has an EVA foam section in the mid-sole, acting as a cushioning arch support and is quite helpful for wearing on hard surfaces. We tested these shoes in work, getting some interesting glances during client meetings! Both myself and our sub-editor wore this pair on consecutive weeks. I even wore mine out shopping with the wife! Personally, I’m going to come clean about this; I’ve never worn a set of Crocs before and didn’t fully understand what all the fuss was about. I do now! Wearing Crocs is quite unlike many other shoes and possibly not to everyone’s taste. The gel-like material is extremely flexible which almost gives the impression of walking barefoot at times, exactly what the makers of Crocs designed in at the beginning. One thing I and my sub-editor liked, was the arch support in the mid-sole. That EVA foam is cushioning yet has enough support to make walking comfortable. I found myself reaching for the Crocs frequently by mid-week, even using them for quick trips to the shop; something that had been the preserve of a pair of battered (But very comfortable) Chuck Taylors. Overall my time with these Crocs was very comfortable. Although I didn’t spend more than 5 hours walking or standing in them at a time, I can easily see them being just as comfortable after 5, 8 or even 10 hours’ continuous wear. Verdict: The original and best comfort shoe! The gel material is super supportive and has enough cushioning effect to support your feet all day long. Perhaps not suitable for dressy or office wear but could be the perfect shoe for chefs or hospitality staff. All the comfort of a pair of Crocs with a non-slip sole and a slight heel. That’s what you can expect from a pair of Mercy Work Crocs. Available in black and white, these Crocs have the same EVA foam in the in-sole, plus a flexible sole with tread that’s been tested to ASTM F1677. This means you’ll have full grip even on wet flooring and spillages. It’s obvious that with a white pair on offer, Crocs have aimed this pair squarely at the hospitality and food industry. White rubber boots are required wearing in some kitchens and manufacturing facilities. Somewhere we can see these Crocs working very well in. These shoes are specially designed for women, sized appropriately and with a slightly modified arch support tailored to a woman’s needs. Karen tested this pair of Crocs for a solid two-week period, clocking up 200 hours straight, even attending a stand-up concern in them! She found this pair “unbelievably comfortable” (Her words, not ours!) and was able to stand up for lengthy periods without cramping her heels. Exactly as I discovered with the male pair, Karen found herself naturally reaching for the Crocs for any outdoor tasks and those late night visits to the supermarket. Arch support is second to none and the gel construction doesn’t rub, even without wearing socks. Verdict: Just as comfortable as the men’s pair with a white coloured option that will suit hospitality and food manufacturing workers just perfectly. Non-slip soles just add to this “fit for work” design. If you need a quality pair of shoes for standing all day long, the choices are pretty good. Even some sports brands like New Balance and Saucony have cottoned on to the fact that trainers are an important choice for those who need to stay on their feet for 8+ hours a day. The first thing to consider when purchasing good standing work shoes, is the arch and heel support. A good, supportive yet forgiving heel is the first step to avoiding issues like Plantar Fasciitis with a gel or air bubble being the ideal solution. 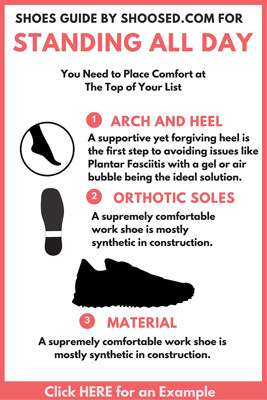 As far as arch support goes, most orthotic soles will have this designed as standard. You will although discover that many cheaper brands ditch this to make their shoes cheaper. A good, quality pair of work shoes should have a foam cushion as a minimum and ideally, an extension of the gel heel to give a little support to the arch area. Asics branded trainers plus other Tennis / Squash trainers are probably the best examples of this in action. Tennis is such a punishing sport on the lower limbs that all trainer tends to be designed for absolute cushioning and support. Another thing to make sure is that your chosen pair will last the test of time. This is especially true for outdoor workers and those in the hospitality sector where shoes put up with unbelievably harsh conditions. Thankfully, every shoe we’ve reviewed here was specifically chosen because of the quality of construction and reputation of the manufacturer. Some have even been specially designed for heavy kitchen or canteen use, such as the Mercy Crocs women’s range. Although some of the trainers we tested have a mesh upper. We ensured that some of our trainers also featured fully leather lined uppers. We know that mesh doesn’t always stand up well to harsh outdoor use which is why we included the Saucony range of walking shoes. When choosing a good pair of best shoes for standing long hours, it’s often a trade-off between tough materials like leather, and more flexible and comfortable man-made linings. This can be especially tough when looking for a dressier pair of shoes to wear all day. Almost all dress shoes like to use a leather construction with synthetic material seen as a “poor man’s substitute”. Ideally, a supremely comfortable work shoe is mostly synthetic in construction. Technology means that man-made materials are just as strong as leather while helping your feet to breathe. Leather can be difficult to break in quickly which is an important consideration when your first usage could entail walking or standing for many hours. Almost all the dedicated work shoes we tested feature slip-resistance of some description, some even being tested to quality standards. If you plan on working in a wet area or outside, always ensure your chosen pair feature a robust and reasonably aggressive tread pattern. Just as with a road car and its tires, the deeper the tread, the more grip your new shoes will give you. Ultimately, you’ll have to balance your works dress code, safety requirements and budget with the type of shoe that works for you best. Thankfully, we tested many variants during our review so hopefully, you’ll see something that should work well. This is the main message we hope you take away. Whatever work you do, places you visit and surface you walk on, comfort and support are crucial to avoid future health problems. If you wear incorrect shoes for your feet and stand for 8+ hours regularly, you’ll be storing up issues like muscle fatigue, varicose veins plus nastier complications such as joint compression. Make sure you purchase an orthotic designed shoe that supports all your joints and gives a cushioning effect on the concrete of tarmac. You can keep your joints in great shape and have a better day at work!